← Visualizations Trapped behind Glass? I’m someone who can never keep dates straight. I have to contextualize events in order to remember when they happened. As we’ve been talking about the history of mapping, visualizations and trees, I’ve also been thinking about timelines and how they fit into our conversations and map information–perhaps in ways that might help me to visualize and remember events in relation to one another. I also recently discovered the book Cartographies of Time: A History of the Timeline (which I can bring to class), which reminds me a bit of the first chapter of Lima’s book exploring the history of tree visualizations. Searched Bamboo DiRT, found a few timeline tools that looked interesting: a new project that hasn’t yet launched called Time Flow. 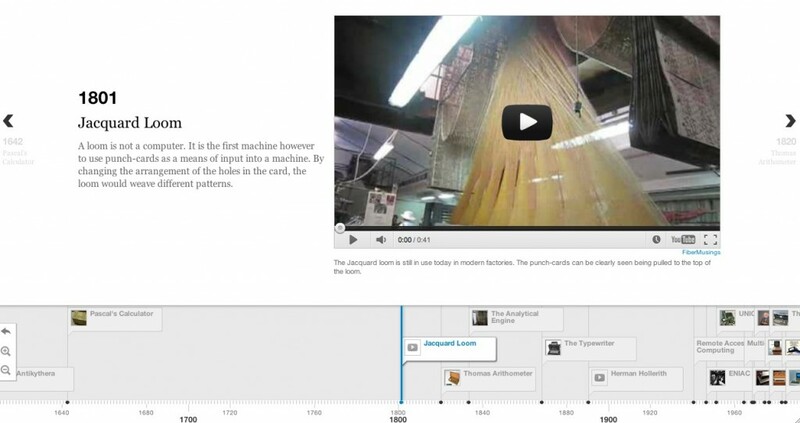 And another tool called Timeline, which makes really nice looking timelines, with embedded videos and image capabilities–so I decided to try to play around with it a bit. Timeline gives the option to download or to place the information that you want in your timeline in a Google Doc (by entering all the data in a spreadsheet, publishing the spreadsheet, and using the link as html that could be used to put the information on a website). Both options were pretty confusing for me, and perhaps compacting the issue is that I don’t necessarily have an already-written timeline to use to experiment with. However, the code is open and the developers seem happy to get feedback. My first suggestion would be to create more documentation that walks all folks through the process of using the tool (!). I’m going to do a bit more investigating and see what else I can find or accomplish. This entry was posted in Uncategorized and tagged timelines, visualization. Bookmark the permalink. Huh–this makes me think about viewing multipe timelines as some kind of graph-like visualization running alongside one another (like Ngrams? ), or more three-dimensional timelines than the usual we’re used to seeing. It also makes me think that timelines are still stuck in Super Mario (horizon line on the screen–very flat) when maybe we should be thinking more so in terms of interactive gaming, etc. ?